Since Christianity is one of the world's largest and most pervasive religions, it should come as no surprise that one of its central tenets is featured in many works of fiction: the concept of a Heaven and a Hell. This doesn't mean that the works have to represent both sides in strictly biblical terms (or even name them as such), but should follow the traditional depiction of both sides. One of the most common ways this appears is having the central plot resolve around an actual physical battle being fought between the two forces, usually The Armies of Heaven versus The Legions of Hell. Typically, this battle is being fought in secret while the rest of the world goes about their "happy" lives. The motives of both may differ slightly from work to work, but it generally revolves around wanting to Take Over the World. Granted, this conflict is typically a metaphor for Order Versus Chaos, but occasionally works will depict both sides as flawed or undeserving. While the central conflict has its roots in Christian dogma, and may even use names, places, and ideas straight from The Bible, expect the works to twist the concept to fit the storyline or the themes of the work. Also, expect lots of quotes straight from the good book and lots of traditional depictions of angels and demons. Compare: Order Versus Chaos, Powers That Be, Harmony Versus Discipline, Balance Between Good and Evil, Light/Darkness Juxtaposition. In the DC Universe, Heaven is known as "The Silver City" and is staffed by badass angels, one of whom joined the Justice League for a while. Hell is actually an evil version of Earth where souls are used as construction materials (seriously) and demon lords constantly struggle for power. In the Marvel Universe, there are several realms known as "Hell" but none is the actual Christian Hell, nor is any demon lord actually Satan (though they often pretend to be). Heaven and God have never been seen (except briefly by the Fantastic Four, and how much of that was real and not a trick by some Cosmic Being remains to be seen). "Hell" was originally one realm, but in the events that gave birth to the Hell Lords like Mesphisto and Sataanish it was smashed and became the "Splinter Realms", which were then divided between those demons and the Death Gods of the various Marvel pantheons. Also, some stories imply that there is indeed a Satan, and others suggest that this is actually all of these demons who periodically merge to become a composite entity. In Johnny the Homicidal Maniac, Hell is just like Earth, but without any of the positive elements. Heaven is a fluffy cloud realm where everyone just stands around all day. Heaven and Hell exist in the Pony POV Series, but are played rather uniquely. Heaven (interchangeably called Elsyium) is ruled by the Father of All Alicorns (who's Exactly What It Says on the Tin) and Hell (interchangeably called Tartarus) is the domain of Havoc, the Top God of the Draconequi. Interestingly, religion is a nonfactor in this universe, neither Elder actually cares about religion and is more concerned with rather the person was actually good or evil in life. Also interestingly, Havoc is not described as the ruler of Hell, instead as its Warden (and given that Tirek is the only escapee in history, a good one) and the tormentor of the condemned. The two sides have only been at war once and it wasn't over the afterlife at all, but occasionally the two do play against each other when a soul would fall between them to test whether the soul will seek atonement or simply deny having done wrong. Also, Havoc allows souls from Heaven to enter Hell to try and redeem and save the souls in him. The Exorcist: With the priests representing the forces of Heaven, the battle is particularly vivid here. Little Nicky: Not much violence between the two forces, but the battle is there none-the-less. A rare example where Hell is depicted as, at least somewhat, noble. The Devil's Advocate is all about Satan's rise to power in modern day New York culminating in an attempt to bring about the Anti-Christ. Constantine deals extensively with the battles of Heaven and Hell and how the titular character is mixed up in them. Black Sabbath's first album with Ronnie James Dio is called Heaven and Hell (it's as epic as it sounds). Wendy Alec's Chronicles of Brothers series is an imaginative expansion of the Bible story concerning the fall of Satan and the ongoing war between Heaven and Hell that will resolve itself in the (interpreted) events of revelations. Ms Alec is scrupulously diligent in sticking absolutely to the script as Fundamentalist American Christian theology interprets it - Rapture and all - and even though her books are essentially Christian polemic and we all know what way the script is intended to end, contrives to create a readable and engaging story. Terry Pratchett and Neil Gaiman's Good Omens is a beautifully subversive take on the idea of Heaven versus Hell, seen through the eyes of an Angel and a Demon who are fated to be on opposite shoulders of the human race - for eternity. Subverted in the His Dark Materials trilogy, in which the afterlife is the same boring, monstrous eternity for everyone and "Heaven" is populated by a corrupt Celestial Bureaucracy. God doesn't seem to be around to keep them in check. Many classic literature pieces dealt exclusively with the realms of the divine and the damned. Our "traditional" depictions of them were created by such works as Paradise Lost and The Divine Comedy. In the Incarnations of Immortality series, Heaven and Hell (as well as Purgatory) are all places to which a soul may go when it dies. Where a soul goes is based on the actions taken by the person. The actions are judged according to an ancient contract between God and Satan. Ironically, Satan wants to update the contract to be more in touch with modern values (i.e. having a child born out of wedlock is not automatically sinful, nor is the child penalized for it), while God remains totally silent on the matter. The reason for God's silence is a main driver later in the series. Robert A. Heinlein's Job: A Comedy of Justice was a re-telling of the classic Biblical story with the author's own take on divine beings and the afterlife. Adam R. Brown's Astral Dawn features an epic war between the forces of Heaven and Hell, though they are typically referred to as Averya and Nazyra. They are the same places, however, as it is established the same places spoken of in the Holy Bible are known by many names. In Supernatural, the war between demons and angels became a major plot point eventually and was a case of Grey and Black Morality. The Bayonetta series follows the conflict between the various forces of the "Trinity of Realities", Paradiso (Heaven), Inferno (Hell) and the human world. While the Umbra Witches and Lumen Sages are forces of the human world, they are aligned with Inferno and Paradiso respectively. In the first game, Bayonetta fights angels and even travels to Paradiso for a few levels, while in the second game she also travels to Inferno and fights demons. Diablo: The entire conflict of the story is a battle between the High Heavens led by the Angiris Council and the Burning Hells led by the Seven Great Evils. Disgaea: Hour of Darkness: The central conflict again. Slightly less dogmatic than other versions. A Batman Gambit done by the benevolent leaders of both eventually succeeded in uniting the two. Most of the plot of both Nexus War games revolves around the battle between the angels of Elysium and the demonic hordes of Stygia. There are several neutral free-will-aligned deities around as well to make for a Mêlée à Trois, but the main focus of the lore is on heaven vs. hell. The Holy Bibble is a comic retelling of the Bible. Complete with behind the scenes stories on the angels and demons involved. The Brick Testament also retells the Bible. This time using Legos. South Park has very unique versions of heaven and hell. Nearly everyone goes to Hell except for those belonging to one religion, so Gandhi, Hitler, John F. Kennedy, and Ted Bundy are all in the same place. Satan is Affably Evil and enjoys throwing big parties. Up above, God is a bunyip who rules over a Fluffy Cloud Heaven. The residents of Heaven are Mormons and Sadaam Hussein (although he was sent there as a punishment). However, God can change the rules so more people can be allowed in. 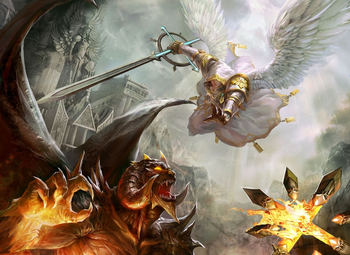 The person who gets to the highest level in "Heaven vs. Hell" for the PSP on Earth is selected to lead the armies of Heaven against The Legions of Hell, but must not be revived in any manner. God created the PSP for this purpose; the individual uses a Golden PSP to do this for real and is referred to as "our Keanu Reeves."